Henry Watson & Sons ("Moved"), H R Brown Chemist, James Duckworth Ltd.
Brown's was an old fashioned Chemist with Mahogany counter and rows and rows of small boxes, each with brass handles and Latin names in Gold Gothic lettering. In the window were 3 beautiful, large bottles with long necks and cut-glass stoppers. Each was filled with a different coloured, translucent liquid: Red; green; blue. The passage on the left leads to Brookside and the building on the right is Woolworth's. The Chemist looks empty and forlorn, Watson's have already moved but Duckworth's still have some tinned goods in the window and on the counter. This was probably taken just before the block was demolished to make way for the more modern style building, presently occupied by Superdrug, which does not quite fit in with the others in that area. I too remember the three large bottles in the Chemists window each filled with brightly coloured liquid. I remember that two of them were red and green, they fascinated me as a child. I remember buying chemicals here for chemistry experiments in 1957/58. The passage to the left leads to Birtwhistles Yard. My wife's Aunt and Grandfather lived there. Her great uncle drowned in the stream at the bottom. 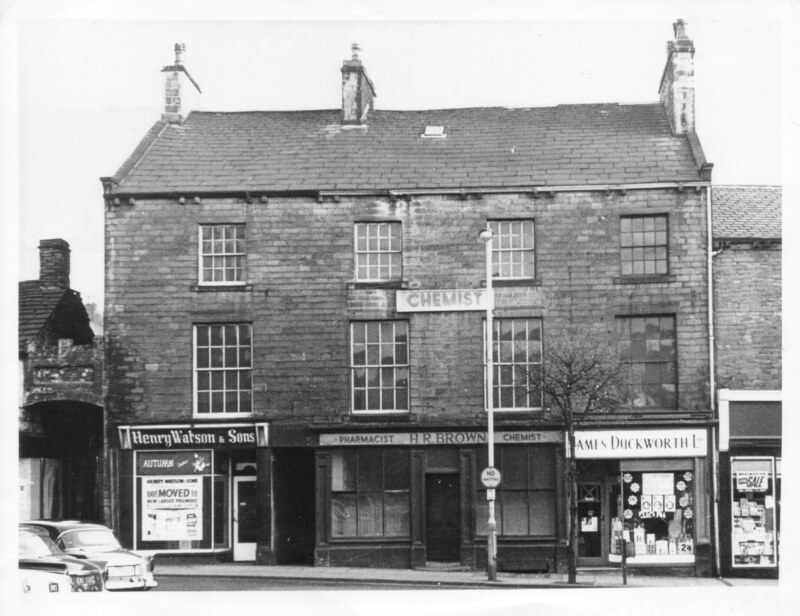 This is my Grandad's Chemist in Skipton. Thanks for posting the photo!